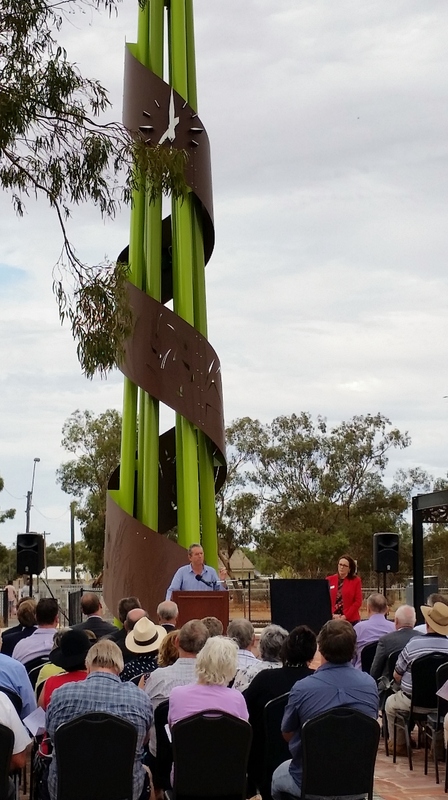 The newly transformed Morawa town centre was officially opened today by Regional Development Minister Terry Redman. The revitalisation was made possible through an investment of $5.53 million through the State Government’s Royalties for Regions’ Mid West Investment Plan and SuperTowns program. Mr Redman said the project had transformed the town centre, creating an attractive place for business investment, tourists and visitors. “Morawa is central to providing services to both the mining and agricultural sectors in the North Midlands area of the Mid-West. It is now prepared for further investment and development of retail, commercial, office, entertainment and community activities in the town centre,” he said. The new civic square provides the town with a central focal point for community and civic events delivering an attractive, family friendly meeting place. It features artistic and artisan elements made from the Morawa stone, terraced seating and shady trees along with amphitheatre space for live performances and space for the town’s regular pop-up markets. 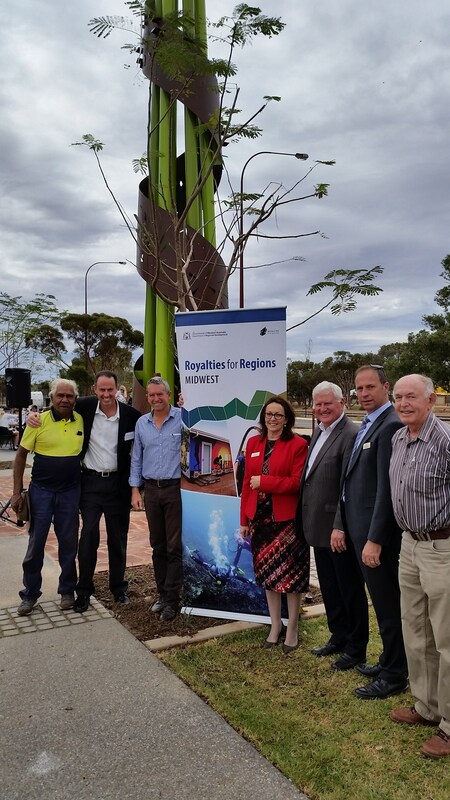 “Royalties for Regions is about providing critical services and infrastructure to support economic and social development and this revitalisation project will be a good example of how the investment will benefit the community, region and the State,” the Minister said. The completion of the first two stages of the five-stage revitalisation plan included the improvement of the eastern side of the rail corridor in line with Public Transport Authority rail crossing and fencing requirements; upgraded power and wastewater services; quality landscaping; new car parks; and an improved pedestrian network. A town that has growth potential. The SuperTowns vision is to have balanced communities, with lifestyle options and access to services. They will have affordable, quality housing and a diverse range of job opportunities. The towns will offer more choices for people to live in regional areas and an attractive alternative to living in the metropolitan area. What is the main objective of the supertowns initiative? This initiative supports regional towns to prepare for the future so they can take advantage of opportunities created by WA’s population growth to 2050. The Western Australian population is predicted to more than double to 4.9 million by 2050. Metropolitan Perth is expected to grow to 3.8 million and regional WA to 1.1 million by that time. This will create opportunities for regional towns to grow their communities and help them realise their full potential. SuperTowns will build on their natural population growth and the unique geographical and economic advantages of each town. The initiative also seeks to create the new business opportunities required to attract investment and generate the jobs required to attract more people to live in those towns. Which towns have been selected for the regional centres development plan (supertowns)? How were these towns selected? The six Regional Development Commissions in the southern part of the state were asked by the Minister to nominate towns within each of their regions and provide supporting information. An assessment was then undertaken by a steering group comprising representatives of the Department of Regional Development and Lands, WA Planning Commission, Department of Planning, Department of Local Government, Department of Agriculture and Food, and the six Regional Development Commissions. It then provided advice to the Regional Development Council, which then provided advice to the Minister for Regional Development; Lands for submission and consideration by Cabinet. The assessment process was mindful of major state and commonwealth initiatives such as the State’s Regional Freight Strategy, the Workforce Development and Training Plan and the National Broadband Network roll out. Why is the focus on the south of the state? Significant Royalties for Regions investment is already either planned or underway in the Kimberley, Pilbara, Gascoyne and MidWest Regions to address immediate pressures due to major resources sector activity, and prepare towns in those regions for the future. Significant investment will now be directed to towns in the southern part of the state to facilitate growth in response to WA’s expanding population.